Os grid reference: SY 3967 5432. At the north-side of Whitchurch Canonicorum village, in Marshwood Vale, along Lower Street stands St Candida’s Church (St Candida and Holy Cross), an ancient parish church on an equally ancient site, probably Saxon. The building houses the quite rare 13th century shrine of a Saxon saint who was apparently martyred hereabouts by Vikings; the church then became a place of pilgrimage during the Middle Ages. St Candida is also known as St Whyte, St Wite, St Wita and St Gwen, though very little is actually known about her, and the date of her death not known with any real certainty – although it was, according to legend, somewhere between the 7th-9th centuries AD. The church tower of St Candida’s has some carved stones built into it which depict the martyrdom of the saint. The village of Whitchurch Canonicorum lies in the far south-west of Dorset – a few miles north of the A35 on country lanes – some 6 miles north-east of Lyme Regis and 2 miles north-east of Charmouth. Within the parish church stands a rare 13th century stone shrine with three large oval-shaped apertures and, inside this there is a lead reliquary which is said to contain the bones of a local Saxon saint called Candida or Wite who was martyred at nearby Charmouth, probably at the beginning of the 8th century AD or, possibly in the 9th century? Some historians ‘consider’ her to be a saint from south Wales called Gwen Tebrion, but this seems most unlikely as St Gwen lived at an earlier date, the 6th century, but she shares the same feast-day 1st June. Gwen means ‘White’ in the Welsh language form. The assumption was that King Athelstan gave the ‘so-called’ relics of St Gwen to the church at Whitchurch Canonicorum back in the 10th century AD. A reference in the Reader’s Digest book ‘Folklore Myths and Legends of Britain’ says of the apertures in the medieval shrine “pilgrims thrust diseased limbs or bandages in the hope of miraculous cures”. Indeed numerous miracles of healing the sick and infirm have been recorded here over the centuries. An early miracle recorded at the shrine was the restoration of sight (Rodney Castleden, 1986). In an article by Rodney Castleden ‘Saints, Shrines & Miracles’ for ‘Exploring The Supernatural’ magazine in 1986 we are given some interesting information about St Candida’s tomb [shrine]. The author says: “At the turn of the century a crack appeared in the stonework of St Candida’s tomb. It was then possible to examine the leaden reliquary inside… which carried the inscription HIC REQUEST RELIQE SCE WITE (Here lie the remains of Saint Wita? Wita was an alternative name for Candida. The lead box was opened up and inside were found the bones of a small woman who was about forty years old at the time of her death”. Castleden goes on to say that: “Very little is known about St Candida. Indeed, it may be her obscurity that ensured that she attracted no attention at the time of the Dissolution. All that we know about her, apart from the evidence of her shrine, rests on local tradition, which may or may not be reliable. The local tradition says that St Wita, or Candida, was a Saxon woman killed by the Danes on one of their raids when they landed at Charmouth. Part of this tradition is preserved in carvings on the church tower; they show a Viking axe and a Viking longship, the agencies of Candida’s death”. The parish church of St Candida and Holy Cross stands on a Saxon foundation, but the present-day building is architecturally Early English (late Norman) to Perpendicular – 12th to 14th century. The font is Norman and the pulpit Jacobean, and it is noted for its nave arcades and tombs, according to The Illustrated AA Road Book of England & Wales. 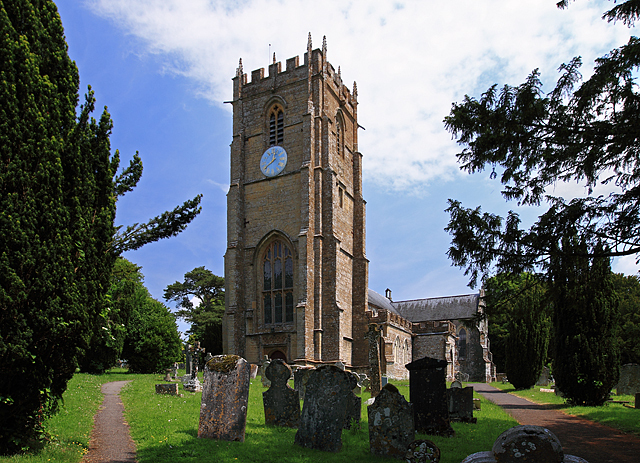 Authors Jones & Tricker ‘County Guide To English Churches’ say that: St Candida’s is “nearly all EE. The south doorway is however Norman and the S porch Perp. The arcades are EE with stiff-leaf foliage and trumpet-scallop capitals. The fine tower has eight pinnacles and is Perp. 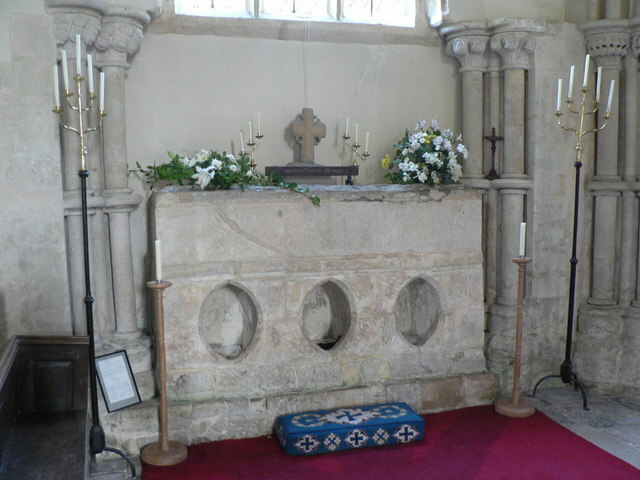 Norman font with intersecting arches, 16th C stalls (French) and Jac pulpit”. It is of interest here to mention that just 1 mile to the south of Whitchurch is the village of Morecombelake and a healing well dedicated to St Candida (Wite). The well has long been able to cure eye troubles. Indeed author Rodney Castleden says: “Dorset children still call the pale blue flowers of the periwinkle ‘St Candida’s Eyes’, which again links the saint with eyesight. The well and its magic properties seem likely to form part of a much older tradition, from long before the Christian era”. Castleden, Rodney., Saints, Shrines & Miracles, The Supernatural Magazine, November 1986. Jones, Lawrence E. & Tricker, Roy., County Guide To English Churches, Countryside Books, Newbury, Berks, 1992. Reader’s Digest., Folklore Myths & Legends of Britain, (Second Edition), The Reader’s Digest Association Limited, London, 1977. The AA, The Illustrated Road Book of England & Wales, (Second Post – War Edition), The Automobile Association, London WC2, 1962. Categories: Ancient Churches & Chapels, Holy Site/Place of Pilgrimage | Tags: St Candida's Church at Whitchurch Canonicorum in Dorset, St Candida's Shrine at Whitchurch Canonicorum | Permalink.